Now, let’s get the legal stuff out of the way first. 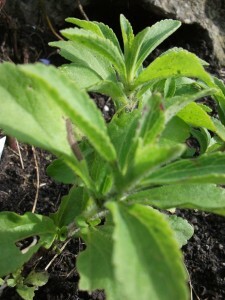 Because make no mistake: stevia, aka sweet leaf or sugarleaf, is, or rather was until recently, an illegal substance. You couldn’t buy it for the garden as it was somewhere on the same tray as cannabis and opium poppies as Plants You Could Be Arrested For Owning. Then they said OK, we realise we’re being a little ridiculous here as they’ve been growing it in Paraguay for 500 years, so you can have it in your garden as long as you promise not to actually do anything with it. Now, however, they’ve relaxed the rules a little, and last November the EU belatedly lined itself up with the rest of the world and approved the sale of products with stevia in them, fully labelled as a natural sweetener. This completely absurd shilly-shallying, though, has left stevia with a little whiff of the forbidden fruit, a dusting of rebelliousness among all those nice well-behaved legal herbs like thyme and marjoram. If it were a person, it would be Patti Smith. That makes it quite the coolest, hippest herb in the garden. Stevia, or Stevia rebaudiana to give it its full name, hails from South America, where it’s been used as a natural sweetener for centuries. So intensely sweet is the leaf that it’s said to be 300 times more powerful than sugar: if you take a little bit of the leaf and chew it, you’ll get a sugar hit to make you gasp. Despite its obvious commercial possibilities it’s struggling a little to challenge the artificial likes of aspartame and saccharose, despite the enthusiasm over the fact that it’s a natural product (no carcinogen cloud hanging over it) and has zero calories. The reason is the slightly bitter, liquorice aftertaste you get, which unsurprisingly isn’t to everyone’s taste. The plant itself is modest but quite pretty: it has little starry white flowers in summer (to keep the leaves coming, though, pick the plant over regularly to prevent it flowering). The leaves are gently toothed, a little like its close relative the chrysanthemum, and it grows to about 60cm tall in a nice leafy clump. It’s generally pretty undemanding, but the one drawback is that it isn’t frost-hardy, so in November as temperatures start nudging towards zero, dig it up and bring indoors to sit on a cosy windowsill or in a frost-free greenhouse until it warms up again next spring. You can be good, and grow it to admire it as a little curiosity for the herb garden. Or you might want to walk on the wild side and dry a few leaves to crumble into your tea, just as an experiment: one or two leaves per cup, depending on how sweet your tooth is, would probably do it. There are now even stevia cookbooks (kept in a brown paper cover and only brought out by torchlight) with recipes for cookies, cakes and pies using the herb should you really want to get reckless about it. And while you’re indulging your sweet tooth you can stick two fingers up, in true punk rock style, at those people in flash buildings in Brussels, still no doubt busy filling in the paperwork allowing us to say out loud we’re growing stevia to use it in our tea. They don’t know what they’re missing.